On 22 June Belarusian president asked PM Mikhail Miasnikovich to tackle inflation and ensure that the country’s average salary would reach $500 by the end of the year. In fact, it is not the right time to share oil revenues with the population when authorities badly need free money to repay their foreign debt and modernise the economy. The Belarusian leadership understands that reforms are inevitable, but they fear to change radically the existing system of power and redistribution in hopes of maintaining the status quo with the help of Russian subsidies. But the more loans are taken and reforms protracted, the more money will be needed to change direction and get on the right track. Russian businessmen are waiting with impatience for Lukashenka to announce that socialism is over and the sale of state property is open. Authorities managed to overcome the consequences of a large-scale crisis that started last spring. In particular, the first quarter saw a trade surplus of $700m. This indicator became positive for the first time in many years, though this happened only due to Russian oil and gas discounts. Moreover, the National Bank accumulated $7.975bn in gold-exchange reserves by 1 May – enough to pay the country’s import expenses over 50 days. And the inflation rate is going down. But in the wake of parliamentary elections Lukashenka ordered to fulfil populist promises to increase the average salary throughout the country to $500 (in contrast to nearly $250 in January), rather than to continue on with a program of tough fiscal discipline. Thus he made the same mistake as he did before the presidential election in 2010. The economy has not yet demonstrated any breakthrough to justify such a raise in salaries. On the contrary, the production of machinery and electrical equipment fell by more than 12% and stockpiles of goods are rising. It clearly shows that foreign consumers have become less interested in Belarusian products. Thus Belarus is becoming increasingly dependent on Mr. Putin’s whim. If he wants, the oil discount season may come to an end very soon. And what does he want? He would like to help his friends from Russian business acquire Belarusian enterprises. Terms of the Russian-sponsored $3bn EurAsEc loan entailed the privatisation of $7.5bn of Belarusian state assets over the next 3 years. The officials in Minsk are making attempts to resist the pressure. On 2 May the vice-PM Siarhei Rumas denied the very existence of list of enterprises intended for privatisation. But everybody knows that privatisation is inevitable because Belarus does not possess any other significant sources of revenue. The IMF may possibly know it even better as it waits for repayment of $3.8bn of Belarusian debt over 2012-2014. Today Belarus is the only Eastern European country that has not yet implemented large-scale privatisation. The state owns about 70% of all industries, including metallurgy, oil refining, chemicals manufacturing and many others. As European countries impose sanctions on Belarusian companies, Russian businessmen are waiting with impatience to gain economic control over the country in the centre of Europe. In May the wealthiest Belarusian businessman Vadimir Peftiev sold his enterprise Beltekhexport that came under EU sanctions to a Russian businessman Dmitry Gurinovich. If the EU’s aim is to assist Russian businessman in acquiring Belarusian state assets, sanctions are probably the best option. Now the biggest Belarusian company Belkali agrees to establish a new potash trader SoyuzKali in Switzerland instead of the existing Belarusian Potash Company that is accounting for 43% of the global market. Who is its partner? It is the largest Russian potash producer, Uralkali, whose management thinks that Switzerland is better than Belarus because of lower "political risks". At the beginning of the deal, Belarus expressed the wish to expand activities of the Belarusian Potash Company, but leave the enterprise on its territory. For example, deputy foreign minister Alexander Gurianov stated on 14 June that "Minsk will preserve important coordinating functions". 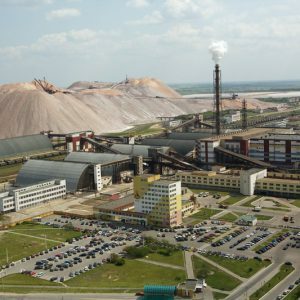 However, vice-PM Vladimir Semashka said a week later that the Belarusian Potash Company would remain only “for some time with some functions”. The new trading company SoyuzKali will be created on a parity basis, with each potash producer owning 50% of the shares. But some observers think that Uralkali’s leadership will lobby the Kremlin to approve a structure which would allow it to obtain partial control over BelarusKali without purchasing it. Though some experts suggest that having a headquarters in Switzerland may help avoid EU and US economic sanctions, it is hardly possible, because the involvement of the Belarusian government in this project is evident. It is rather the intention to benefit from access to funds at reduced interest rates based on the company’s efficiency and not on the low credit ratings of Belarus and Russia. BelarusKali, one of the world's largest potash producers, is a valuable asset and several countries stand in a queue for its shares. According to Indian newspaper Business Standard, the Indian government set the purchasing of a part of BelarusKali as one of the priorities of its foreign economic policy. The Kazakh ambassador to Minsk Ergali Bulegenov dropped a hint during his interview to Belarusian TV that Kazakhstan might acquire 25% of BelarusKali shares. China could also be interested in such a deal given that it buys prominent amount of BelarusKali’s fertilisers and is on good terms with the Belarusian authorities. And there is, of course, Russia and Suleyman Kerimov for whom the acquisition of BelarusKali means becoming the world's number one potash producer and thus overcoming Canada’s Potash Corp. However, it is not easy to buy BelarusKali. Lukashenka announced on 8 May that its price is estimated at $32bn. And a week later Vice-PM Semashka suddenly said that authorities would never sell a controlling interest in BelarusKali at all. Although privatisation allows the Belarusian regime to receive vast sums of money to survive, it would change the very essence of the existing power system. It would allow different stakeholders to influence Lukashenka’s policies and put an end to his model of “market socialism”. That is why the authorities are trying to put off any final decision. A government insider recently told leading Belarusian news portal TUT.BY that the decision to postpone privatisation had been made after the analysis of those who would be potential buyers of Belarusian state assets. According to some estimates, Russia would acquire 80% of the enterprises. Unfortunately, European and American businessmen do not want to invest in Belarus due to human rights violations and absence of the rule of law. And that’s a pity. Lukashenka will step down sooner or later, but if most of the country is controlled by Russia, there would be no European future for Belarus. CSO Sustainability Index for Central and Eastern Europe and Eurasia. The U.S. Agency for International Development CSO Sustainability Index to measure the progress of civil society organisations (CSOs) in the Central and Eastern Europe and Eurasia region. The report on Belarus suggests that despite the difficult environment in which it operates after the December 2011 presidential elections, the third sector is expanding its capacities. CSOs generate analytical products for use both within the sector, internationally, and in some cases even by the government. The Belarusian Role Model. Youth magazine 34mag composed the portrait of an ideal Belarusian. The "researchers" found 50 ideal features relying on their own ideas. In particular, an ideal Belarusian is free, not nagging, speaks good Belarusian, knows the history of Belarus, open minded, ignores state propaganda, travels a lot and has a multiple entry Schengen visa. Platforma presented the monitoring report. On June 21, CSO "Platforma" held a press conference devoted to the completion of monitoring of Belarusian prisons. The results were presented in the "Monitoring report on the issues of prison conditions in the prisons of Belarus." The report highlights that the major reason of the penitentiary system of Belarus is its absolute secrecy for civil society and human rights that provides the possibility of uncontrolled actions for prison staff. Corporate volunteering in Belarus. On July 5, in the Minsk hotel "Europe", roundtable "Corporate volunteering in Belarus" will present the survey conducted by the Center for European Studies. The survey identifies trends and incentives for the development of corporate volunteering in the country. Internet against drugs. The initiative "Antimak" has proposed to the Minsk police department to more actively use the Internet to combat the spread of poppy seeds which contain opium. Activists believe that the dissemination of the proper information through the Internet and media, including the police online resources, will enhance the atmosphere of intolerance for drugs and drug retailers. Press conference on parking issues. On June 19, a press conference "Addressing the issues of parking on market principles" took place in Minsk. The event was organized by the Center for Environmental Solutions, Fund “Ecological Transport” and Minsk Cycling Community. The press conference presented a Program aimed at addressing the shortage of parking places in Minsk and based on three points: the zonal charge for parking, the formation of a new structure of parking services and the owner's responsibility for car parking. Human Rights Defenders for Free Elections campaign. The human rights defenders have launched a nation-wide election observation campaign ahead of the September parliamentary election at a press-conference held in Viasna’s office on June 21. The Human Rights Defenders for Free Elections campaign is going to involve some 400 observers in 106 constituencies. Electby started countdown. The interactive platform of monitoring elections has resumed its work before the parliamentary elections in Belarus, scheduled for September 2012. It is an open platform where anybody can share their experience and observations of the election campaign. Electby.org is powered by the platform Ushahidi (which means “evidence” in Swahili). It was created by a group of enthusiasts in 2010, before the presidential elections. Civic Campaign "Nash Dom" (Our House) has launched the project to the parliamentary elections. The activists plan to continue their campaign 'Deputies – to the Answer!" that gathers and publishes information on all candidates, regardless of their political orientation. Dzedzich invites to summer camp "Zalessie 2012." Brest NGO "Dzedzich" invites young people from all regions to participate in the volunteer camp, which will be held in the village Zalessie (Kamenets district, Brest region) on July 23-29. The volunteers will help in the reconstruction works of the house which will become a community center for young people. The camp will also provide cultural entertainment for the volunteers. Volunteer historic camps 2012. Belarusian Committee of ICOMOS (International Council on Monuments and Sites) posted on its website a list of volunteer camps in 2012. The proposal is designed for amateurs of historical heritage, who are willing to spend the summer arranging the archaeological sites in the territory of Belarus. The list also contains the camps, held by NGOs – "Historyka", UNESCO, etc. Summer School for experts and analysts. Analytical Center "Strategy" and the Research Centre "Mises" invite to their traditional Summer School for experts and opinion-makers from Belarus and other countries. The topic of this year is "Property and Justice. Belarus and the world at the threshold of the third industrial revolution." The School will be held on July 27-31 in Belarus. “Belarus in Focus”. On June 20, the presentation of the book “Belarus in Focus: through the eyes of foreign journalists” took place in PEN-Center in Minsk. The book is a compilation of articles from an international competition for professional and citizen journalists writing about Belarus, held by Solidarity with Belarus Information Office in cooperation with Press Club Polska in 2011. Essay contest. "Liberal Club" together with the CASE Belarus announces an essay contest "How to conduct market reform in Belarus: economic theory, the experience of foreign countries and the Belarusian specifics." The aim of the competition is to form a community of professionals in the field of market reforms. Two winners will pass a week-long internship in the Warsaw-based CASE office. Award "For Freedom of Thought". On June 19, the traditional awarding ceremony "For Freedom of Thought" name of Vasil Bykau took place at Bykau's homeland, in the village Bychki, Vitebsk oblast. This year bronze statuettes went to local historian Alexander Belokoz and rock musician Lyavon Volsky. The award was established by the leader of the Movement "For Freedom" Alyaksandr Milinkevich in 2008.